Sub Theme : Transforming the world; Connect! Discover! Let each experience fascinate you! 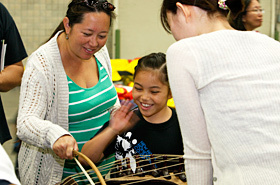 The Educational School Tours was held on Friday, March 1, 2013, at the Hawaii Convention Center. Its purpose is for the local students to learn various traditional cultures from different countries by watching, listening and experiencing them. 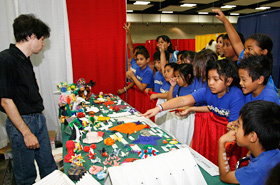 The Educational School Tours was held at the Hawaii Convention Center on Friday, March 1, 2013. Normally, the schools in Oahu are only invited to this tour, however it was opened to public this year as well. There were various activities compared to last year. The students watched the Australian Aboriginal dance and learned about the history of Fukuoka’s Daijayama. There were also opportunities to experience Korean musical instruments, taiko drum, yosakoi dance (Japanese cultural dance), origami (paper-folding), ikebana (flower arrangement) and sado (Japanese tea ceremony). The Friendship Gala is a wonderful opportunity to enjoy the delicious cuisine of Oahu’s finest restaurants. It is also a place to foster friendships and international goodwill. 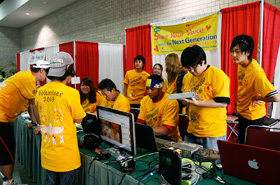 There were various events held at the Hawaii Convention Center. 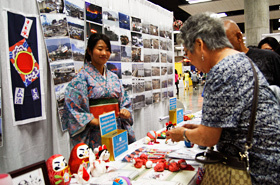 They include, Cultural Exhibitions/ Craft Fair/ Hawaii’s locally made products/ Ennichi Corner/ Bon Dance/ Film Festival. 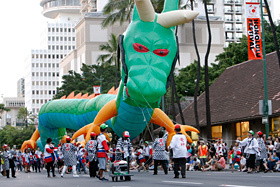 The Grand Parade was held on the final day on Sunday, March 3, 2013, on Kalakaua Avenue, where the crowds started to form along the roadside around 4 p.m.
2 years has passed since the Great East Japan Earthquake, yet there are many who still living in the shelters. 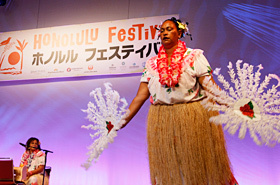 The Honolulu Festival hosted the events in remembrance of those victims and for the recovery of East Japan. There were various participating groups from the countries of the Asia-Pacific region such as Australia, Taiwan, Korea and Japan. 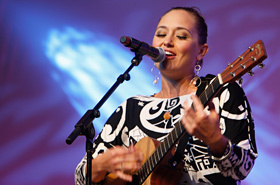 The “Share Your Voice Project” is an educational collaborative project between the Honolulu Festival and Kapiolani Community College. It has been launched since 2010 which will be held for the fourth time for the festival.